But, there’s a whole arena online filled with your target audience that you’re probably ignoring. And yes, you can use social media to grow your list, but it will take some planning on your part since each social media platform needs different strategies. But, it’s worth considering since 65% of the population use social media daily. This means your target audience is on social media – all the time. It’s the perfect place to get on their radar, promote your site, and grow your email list. For this post, we’ll look at three social media platforms – Facebook, Pinterest and Twitter – and the key strategies to use for each platform to grow your email list. Facebook is the place for small businesses and brands. Currently, there are over 50 million businesses using Facebook Pages to grow their brand and engage their target audience. Using Facebook is also the perfect way to grow your email list, and one of the best free ways you can do this is by optimizing your Facebook Page. Facebook allows you to upload a customized image to use as your page header. This is the perfect way to use this spot to promote your company name and place a short link to your landing page. 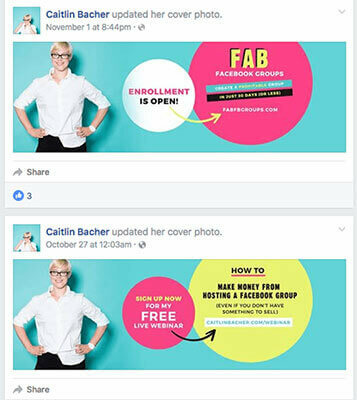 For example, entrepreneur Caitlin Bacher often promotes her latest webinars or courses using her Facebook header image. Since your link isn’t clickable, it’s best to use a link shortener like Bitly if you have a long and hard to remember URL. If you use Bitly, create a customized link so that it’s easy to remember and type. On Facebook, you can pin a post so that it’s always on the top of your Facebook Page. When new visitors come to your page it will be the first post they see on your timeline. 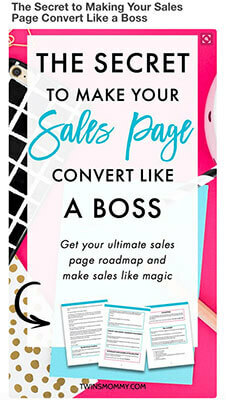 They’ll be more likely to read it and, if you use this spot for your lead magnet, opt-in to your list. 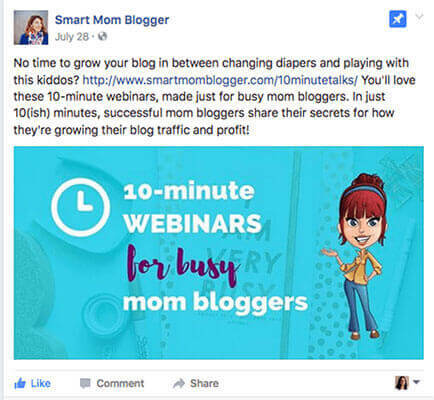 Candis Hidalgo of Smart Mom Blogger pins her 10-minute webinars for busy mom bloggers. She makes sure that her Facebook post explains what her lead magnet is all about. Simply pinning your latest checklist or free course won’t attract new subscribers. Instead, make a small pitch and explain why your audience needs your free resource. On your Facebook Page, you can add a call-to-action to drive traffic to your site. This is also another way to grow your email list since one of the calls-to-action you can use is to sign up to your list. To create a sign-up button, click on Add a Button. From here click on Get in touch with us and a dropdown will menu appear. Click on Sign up and enter the landing page URL or website URL where your opt-in form is. Pinterest is the number one source of traffic for a lot of bloggers and entrepreneurs. It’s considered by some to be the second largest search engine and it’s not going away any time soon. In fact, it can bring in up to 3x more traffic than any other social media platform. And with those impressive numbers, you can’t afford to ignore this platform any longer. But, what about growing your email list? Can you do that on Pinterest? Pinterest is a visual search engine, and it uses keywords to help people find what they’re looking for. And it’s the same for your profile. If you want people to find you and your blog you need to optimize your profile with strategic keywords. For example, if I’m looking for a branding expert, I’ll type in “branding strategist” on Pinterest and I get Andrea ‘Dre’ Beltrami of The Branded Solopreneur as the first result. Dre’s profile is optimized with keywords in her profile name. Your bio should also have keywords related to your niche and a link to your landing page to grow your email list. 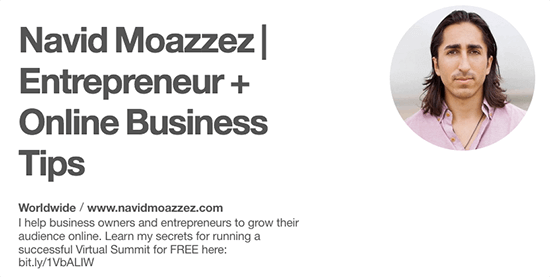 Entrepreneur Navid Moazzez promotes his Virtual Summit in his Pinterest bio, helping him drive traffic to his site and to his email list. A great way to get your lead magnet noticed is to create specific pins for each of your lead magnets. These pins direct visitors to a landing page created specifically for each lead magnet. For example, Jennifer Snyder of Women Winning Online uses the same template for her blog posts to make pins for her lead magnets. Doing that helps to strengthen her brand, and it can help increase her click-through rate since it doesn’t look out of the ordinary. Related Reading: The Only Tools You Need To Dominate Pinterest. Another way to start growing your email list is to create a call-to-action on each of your pins. If you have a content upgrade or free resource you’re offering with your blog post, you create a graphic for it and add it to your pin. Then you point out to your readers what they get for free if they read your post and sign up to your list. When I started my blog, Twins Mommy, I didn’t have a lead magnet. Instead, I used content upgrades to grow my email list and Pinterest to grow my traffic. Whenever I had a content upgrade, I made sure to include a graphic of it in my blog post image. When pinners see what they can get by clicking through, it makes it more likely that they will opt-in to your list. Even though Twitter hasn’t been the most popular platform lately, it’s still a great place to promote your business, brand, and connect with your target audience all while growing your email list too. There are certain things you can do with your profile and strategy to boost your email subscribers. Just like on Pinterest, your bio is a hot piece of real estate and you can use it to promote your latest opt-in incentive. 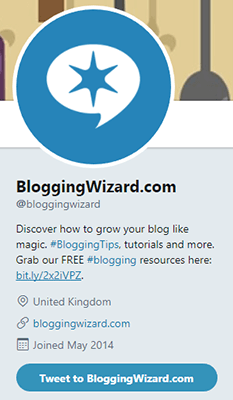 On the Blogging Wizard Twitter account, Adam links to his blogging resources page. Like Facebook, on Twitter you can pin a post – like your lead magnet – on top of your timeline. When visitors look at your profile, the pinned post will be the first post they see. 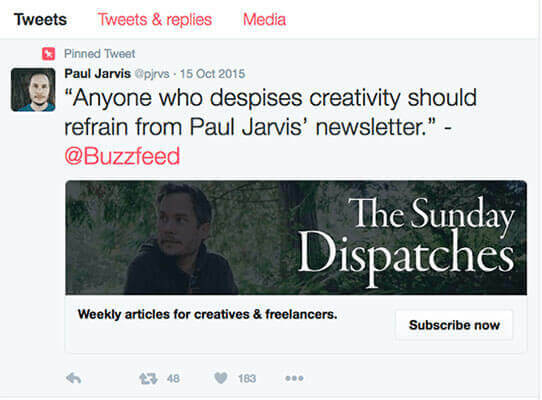 Paul Jarvis also uses a lead generation card on his pinned tweet. 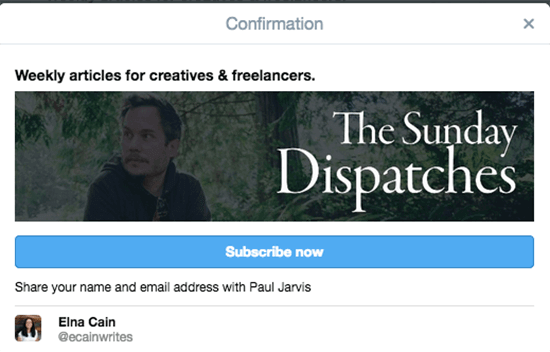 This creates a button and opt-in form right on Twitter. When you click on the Subscribe now button, a popup appears asking you to subscribe. Making opting into his newsletter easy for people – no need to click over to another site and put in your name and email address – increases the conversion rate of his email list subscription. 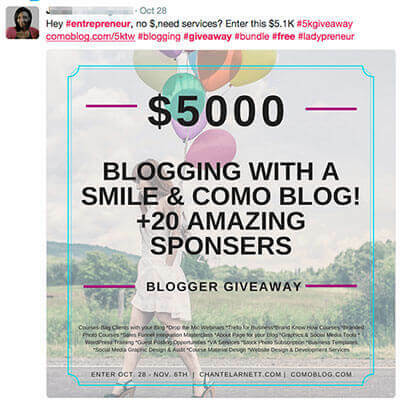 A powerful way to increase engagement, followers, and subscribers is to run social contests. These are promotions targeted at your social media audience. While Facebook is a popular choice to run social contests, other platforms like Instagram or Twitter are becoming more mainstream. To reap the full benefit from your contest, you should consider running your promotion or giveaway with a viral contest tool like Gleam or KingSumo. When people sign up to your giveaway, they become part of your list, helping you double or triple your subscriber list quickly. For your giveaway, you can give away your products, services or bundle them up with others’ products. This is a strategic way to network with influencers and other entrepreneurs for future collaborations. 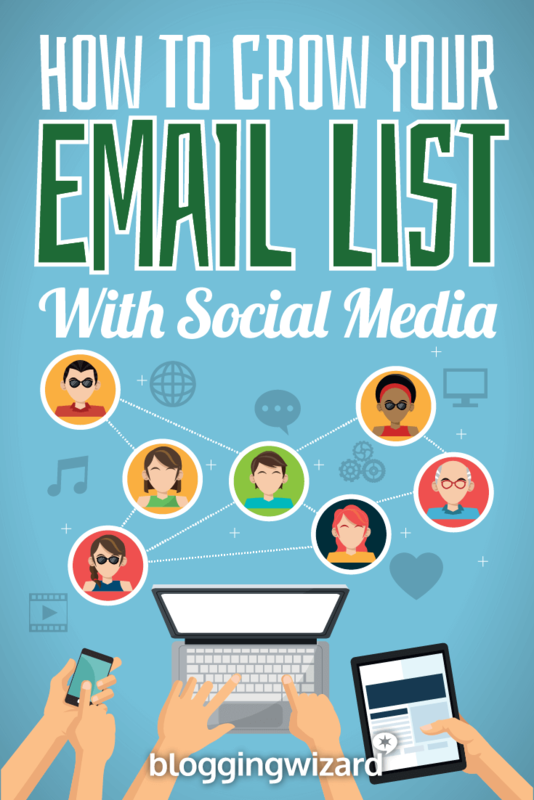 When you use social media to grow your email list, there’s more to it than creating social media posts or shareable graphics. You need to take advantage of each social media platform and optimize your profile to generate more subscribers. This might mean using keywords on Pinterest and including a link to your lead magnet on Twitter. Using calls-to-action in your images is also another way to boost subscribers. 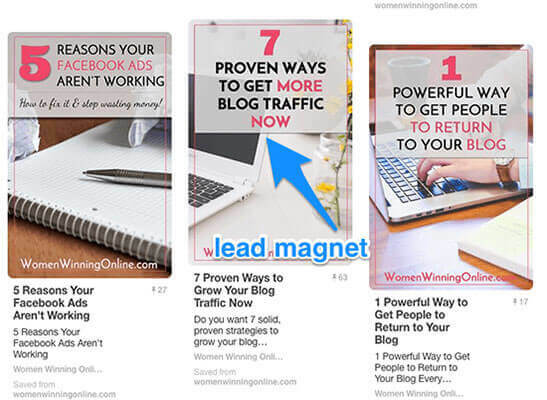 By placing a link on your Facebook header or a graphic of your free incentive on your Pinterest image, you encourage visitors to find out what your lead magnet is all about. Finally, pinning (or making sticky) your lead magnet on any of the three platforms ensures that new visitors coming to your profile will see that post first, click on it, and subscribe to your list.